More than 100,000 people have spoken. And they say this will be the year renovations come back. 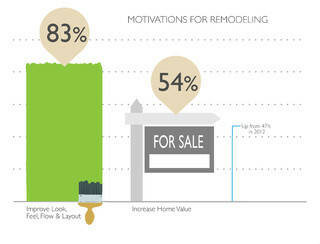 The number of U.S. Houzz users moving forward with decorating and redecorating projects has increased by 12 percent compared to this time last year, and 7 percent fewer people than last year say they are delaying home design projects because of the economy, according to the second annual Houzz & Home survey, which gathered more than 100,000 responses from Houzz's 14 million monthly unique visitors. While improving the look and feel of a space is still the key driver for recently completed home design projects (83 percent said so), the number of homeowners who have or will make improvements to increase their home's value rose 7 percent, to 54 percent, up from 47 percent in 2012. The team at Home Interiors Flooring looks forward to helping you with your next remodeling project - see you soon!